You can make a star book ornament. You could write letters to Santa in it and hang it on the tree. Glue the scrap paper to the cardboard. Fold over the sides, trim and glue down. Fold white paper diagonally, then open it. Fold it horizontal, then open it. 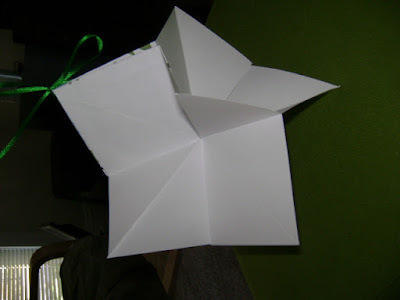 Fold it vertical, then open it.. You should have a plus sign fold and a diagonal fold. Bring the 2 opposite ends together from the diagonal fold. The fold in the middle of those squares should fold inward. When they touch the other sides should come down on top and bottom. I call it the pac-man fold. Fold the other papers the same way. Stack up the folded paper so that they are all going the same direction and glue the stack together. Glue a piece of ribbon on the top of the stack where the paper opens and glue a piece on the bottom where the stack opens. Now glue the paper covered cardboard pieces to the top and bottom of the stack. 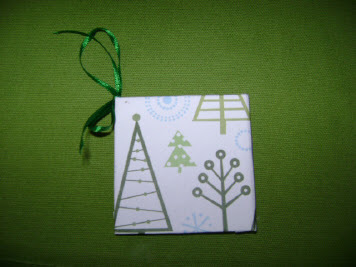 Wait until it is dry to write in it, tie it, or to bend it back to make a star. Copyright © 2007 by Louise. All rights reserved.